Audit NZ and OAG clean bill of health —Suspicious! Saturday, 29 June 2013 9:53 a.m. Learn how the Kaipara council was repeatedly given a clean bill of health by Audit NZ despite the massive debt and obvious governance problems. Compares with how OAG assured me they were closely monitoring the TTCF investigation into how it was that ORFU and Racing were able to fleece $7 million from the South Auckland community. The truth is, DIA lost that file and therefore didn’t investigate and instead deliberately covered the loss up. OAG appear OK with this and issued DIA with a clean bill of health. Our trust and faith in the work of these well resourced “highly educated desk jockeys” is misplaced!!! The commissioners of debt-ridden Kaipara District Council have begun a new inquiry into its past financial decisions, including the advice it received from former chief executive Jack McKerchar. The tiny Northland council is struggling under an $80 million debt, a long-running rates strike and court action by its own ratepayers over more than $17 million of illegally set rates dating back to 2006. Its former councillors stepped down last year in response to a damning report, making way for Government-appointed commissioners. ● An Auditor-General’s investigation into how the cost of a sewerage scheme at Mangawhai blew out from $11 million in 1999 to $62 million, creating most of the council’s debt. ● An independent inquiry into how the Audit Office failed to notice the excessive debt and repeatedly gave the council a clean bill of health. ● The commissioners’ investigation into other financial transactions they have discovered since taking over last September and see as questionable. Northland MP Mike Sabin told Parliament ratepayers had been woefully let down by the council’s “mismanagement, incompetence, carelessness and dysfunctional governance”. Mr Sabin, who is sponsoring a local bill to retrospectively validate the illegal rates, said the bill was necessary to keep the council functioning but it would not allow anyone responsible for poor decisions to duck the consequences. The separate inquiry into the Audit Office’s actions, undertaken by Auditing and Assurance Standards Board chairman Neil Cherry, was not finished. 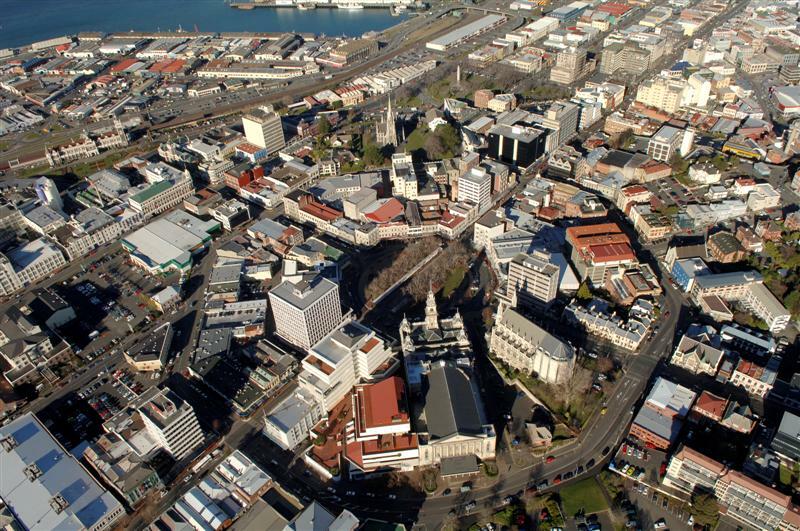 State of the City —DCC or Dunedin? In a variation to the original agreement, the historic brick turnstiles, plus 400m2, have been given back to the DCC at no cost, apart from minimal shared surveying costs. This recognises the New Zealand Historic Places Trust classification of the turnstiles and creates the potential for a ‘pocket park’ to be formed. Calder Stewart will pay $3.5 million for Carisbrook, with $200,000 to be refunded by the DCC as long as all the buildings, apart from the hospitality complex, are demolished within six months. Now that the transaction has been completed, a large number of documents relating to both the original purchase and subsequent sale of Carisbrook, will be released publicly later next week on the DCC website. There were words of praise, but also of caution, as the Dunedin City Council yesterday locked in a 4% rates rise for the coming financial year. Councillors at yesterday’s full council meeting voted to adopt the 2013-14 annual plan, and the 4% rates rise, after months of discussion, debate and public consultation. The changes would come into force on July 1, but prompted little further debate yesterday, as councillors instead praised chief executive Paul Orders and his staff for their efforts. 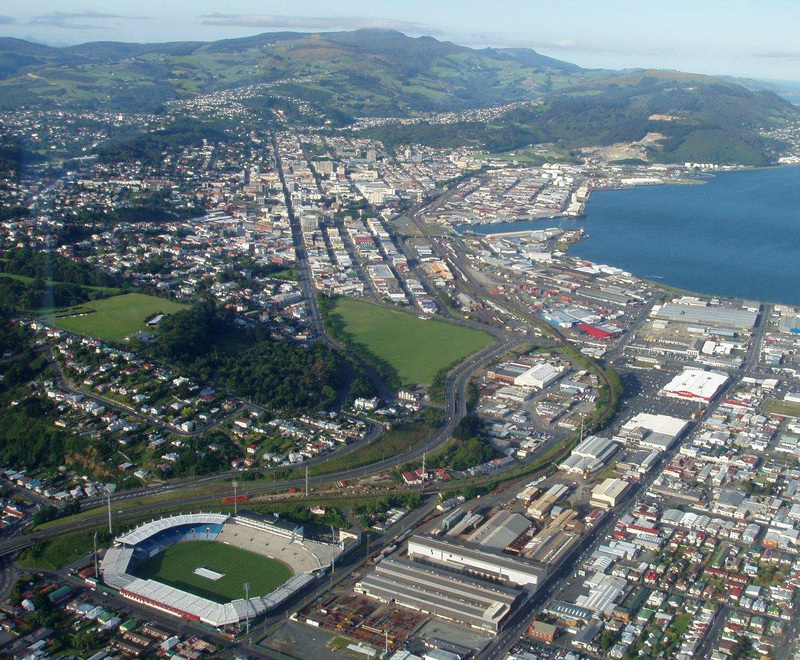 Confirmation of the budget meant a $400,000-a-year events attraction fund for Dunedin Venues Management Ltd, the company running Forsyth Barr Stadium, and other budget proposals were confirmed. Finance, strategy and development committee chairman Cr Syd Brown said the increase included headroom within the budget. That had allowed debt repayments to be accelerated, saving the council millions in interest payments, while keeping the rates increase within the goal of no more than 4%. Without the debt repayments, the increase would have been closer to 2%, Cr Brown said. ”I think that’s a sterling effort by the chief executive and his staff and I think the city’s been well served,” he said. What is Cr Syd Brown really saying? Is he saying the stadium debt, the council’s consolidated debt, the council’s lack of insurance for infrastructure, the seedy DCHL’s lack of traction, and DVL/DVML running significant losses requiring ‘unheard of’ ratepayer funds, is Okay and everything’s well in hand? Or is he snide, skipping out of council before the engulfing mudslide hits, the one he’s made with help from the Good Old Boys. Nothing like an old fox, or an old fool. Syd Brown’s personal fortunes have been tidily aided by his position on council for the implementation of Taieri plan changes, council spending on ‘localised’ drainage, roading systems, and more. Then there are the persistent rumours about connections to pokie trusts and big brothers in racing and rugby. It’s not a clean slate. Can you believe anything Syd Brown has to say about your council’s financial position? DCHL will soon report to councillors on the results of a review of its subsidiary companies. This will be interesting. Cr Richard Thomson opines that from the figures it appears the only way DCHL can meet its dividend payment forecasts will be by borrowing or selling assets, either of which would cause ”considerable concern”. Other reports tabled at yesterday’s meeting of the Dunedin City Council. Discretionary funds: Conflicts of interest? Accountability? Rort? A member of the Mosgiel-Taieri Community Board says the board is a shambles and has abdicated its responsibilities in giving money to a community group last week. Brian Miller believes the granting of $4500 to the Taieri Community Wellbeing Strategy Group, which aims to promote the Mosgiel and Taieri community, meant the board was handing over its responsibilities to an unelected group. Other community board members spoken to by The Star said the board had done nothing wrong and worked well. Mr Miller said the group would overlap the responsibilities of the board and its funding application did not face the same scrutiny other applications did. ”This would be the worst board I have been on. It’s a shambles.” The group had an unfair advantage because chairman Bill Feather and board member Teresa Christie had been working with it behind the scenes, Mr Miller said. Board member Martin Dillon also voted against the funding. Mr Dillon said he had issues with the way the funding application had been made, but had no problems with Mr Feather and Mrs Christie being part of the group asking for funding. *Teresa Christie is the wife of Otago Chamber of Commerce chief executive John Christie. A multimillion-dollar project to transform the former Dunedin chief post office has been delivered. Work on converting the 10-storey heritage building into a 120-apartment hotel and office space for Silver Fern Farms and other commercial tenants could begin within weeks. 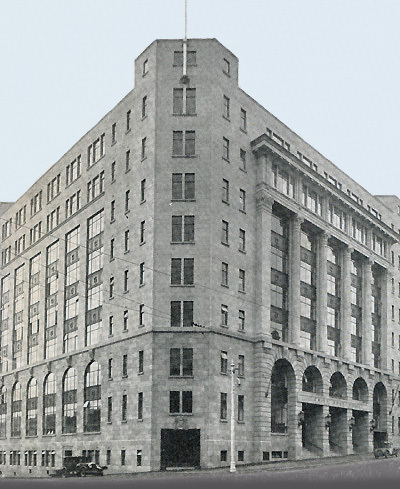 Arrow International would spearhead the fit-out of the office space and hotel and the construction of a multilevel car park at the rear of the building. 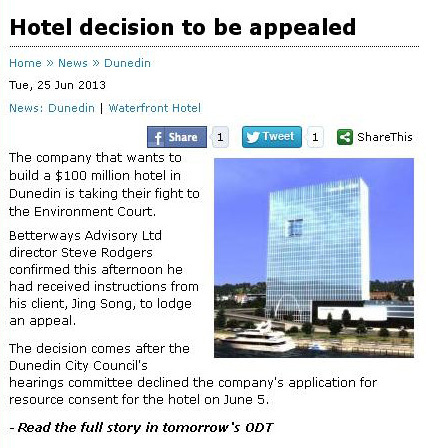 The four-star plus Distinction Dunedin hotel project would cost more than $15 million, but those involved with the project declined to confirm a figure. However, the anchor tenancy of Silver Fern Farms, which would occupy the first two floors, and unnamed commercial tenants the third floor, would help to “underpin the building”, Mr Thomson said. The commercial floors would be fitted out by the end of the year. Construction of a three-storey car park on its Bond St car park at the rear of the building would also be done by then. 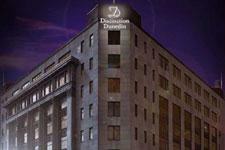 Designs had yet to be finalised for the remaining seven floors of the hotel apartments. 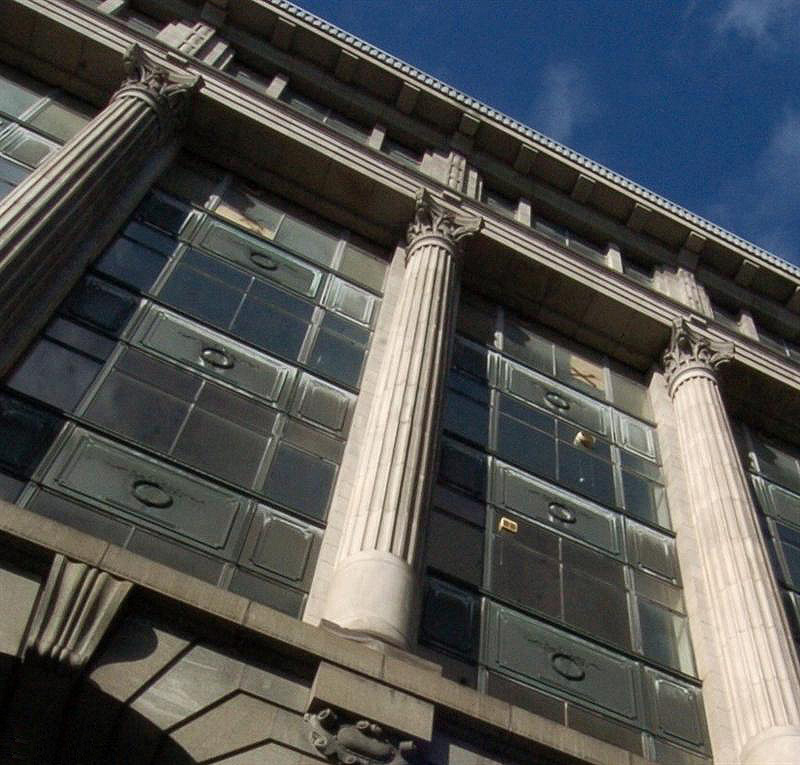 5.3.11 Former Chief Post Office, Dunedin – magazine feature . . .